Looking for an exceptional single monitor desk mount with a vented platform and a removable mouse pad? The MI-75911 is perfect! The cooling venting tray has an attachable mouse pad and mouse holster for standing arrangements or storage. The pad and holster are easy to mount and unmount on the tray. They can also be placed on the left or right side for left or right handed people. The vented holes provide airflow for maximum optimal operating temperatures. The metallic tray will function as a secondary heat sink as well, which will increase the life span of most devices. The solid die cast aluminum alloy is sturdy and enduring. The articulating arm has integrated cable management clips to organize your cables. They can hold multiple cables of varying thicknesses all at once. This mount is engineered to be pleasing to the eye and easy to use. It hides as much hardware as possible while adding tons of functionality to your laptop device. All the assembly hardware comes included with easy to follow instructions. This MI-75911 is our premium desk mount that features two articulating arms that offer a 360 degree swivel, +90 /-20 degree tilt, and a 15.5" height adaptability with vented laptop/notebook platform that helps dissipates heat away from the bottom of your laptop to prevent it from overheating. 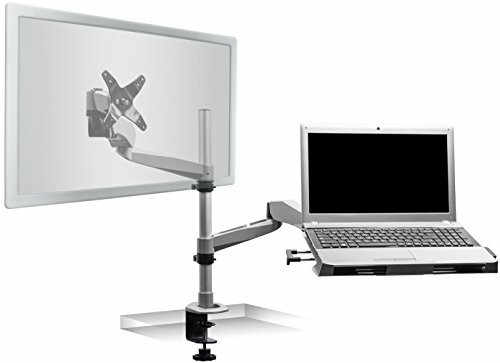 This desk mount includes a vented platform, two spring arms with quick releases, two swivel arms, a monitor bracket, aluminum pole, cable management, grommet, and all of necessary hardware for an easy installation. The tablet or computer tray is vented to provide maximum optimal airflow and the aluminum plate serves as a heatsink to keep your device from overheating. The vented laptop tray comes equipped with a detachable mouse pad and detachable mouse holster.